Album Info: While the crew change for the Salt Lake sub is at Green River, WY (MP 815 on the Rawlins sub), the Salt Lake sub doesn't start until Granger, WY (MP 847). 184 miles later, North Yard at Salt Lake City is reached. Description: Eastbound 3985 bursts out of a short curved tunnel in the Taggarts area around MP 965. Both tunnels were bored through solid quartzite. Description: A few miles west of Wahsatch at MP 931, at the Curvo Crossover Tunnel, the original mainline, now used by westbounds, crosses over the newer eastbound mainline at the west portal. The Challenger has just come out of the east portal. Description: An eastbound autorack train is about to enter the first set of tunnels near Taggarts. 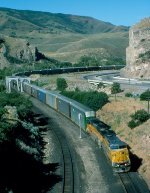 Description: In Weber Canyon at MP 980.9, Devils Gate (also known as Gateway), the UP mainline crosses the Weber River. Old highway US30 used to pass beneath this bridge until I84 was built. The train is climbing the 1.14% grade on Main 1. Main 2 on the left is favored for downhill westbounds because of the steeper 1.72% grade. Description: Out of the tunnel and over the Weber River bridge at Taggarts at MP 963. I shot this from the I80 overpass when one lane was closed for construction. Description: UP 6003 has stopped to allow Amtrak #26 to pass it. The Pioneer will return to the normal eastbound track at Strawberry, MP 978. Description: The LANP exits one of the tunnels in the Taggarts area around MP 964. 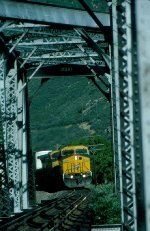 Description: An eastbound manifest at MP 965 crossing the Weber River. The Weber River is crossed four times between Gateway (Devils Gate) and Echo. Description: Another CNW C44-9W is eastbound near Wahsatch. I am standing on a tunnel portal that was abandoned in a 1943 line relocation. Description: A 106 car eastbound manifest passes through a deep cut from a 1943 line relocation west of Wahsatch. The westbound mainline is above the train. Wahsatch is the top of the 1.14% grade at 6,792 ft above sea level. Description: Crossing the Weber River near Mountain Green. Description: A mile from the summit at Wahsatch, this eastbound curves into a deep cut from the 1943 line relocation project. I am standing on the old tunnel portal. Description: A clean SD70m in Echo Canyon.